What are the greatest benefits of the Bio-Mat? 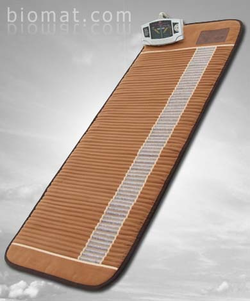 The Bio-Mat deals with primary body function. It provides a high caliber life force energetic that immediately enables the body's waste removal systems as well enables our ability to relax and sleep deeply. As the Bio-Mat activates our body to remove toxins and acidic waste, both from our day to day lifestyles and our stored waste from our lifetime, our brains slow down to Delta brain waves. All the profound healing and restorative functions of the body are accessed through these Brain states. In addition to this, our circulatory system is opened and cleared, this allows us to deliver everything we put into our body 100% better. Whether it is high quality raw foods and supplements or hydration, with the Bio-Mat these are all more effective to our entire organism. How long has the Bio-Mat been in use? The Bio-Mat has been in use since 1997, NASA had the technology patented since the 1960's and it became public domain in 1997. A similar device that was not easy to use was $500,000 and sold only to cancer institutes. Now we can have this FDA medical device in our homes for the cost of a few months of health insurance. There is a lot of research from Japan and Korea, and is used on the hospital beds. It is still relatively fresh here in the United States, but doctors, hospitals, and alternative care practitioners are all using it with amazing results. Who can benefit from the Bio-Mat? Everyone. We all have bodies that create acidic waste every time we eat, think, exercise, stress, etc. Our lifestyles tend to not create enough deep sleep and relaxation, free of mental activity for our bodies to keep up with the waste. This waste gets stored and becomes an acidic cesspool for yeast, mold, fungus, virus, cancer, and disease to thrive. Anyone wishing to restore their body, whether diagnosed with something or just lives in an environment that has toxins in it, will receive benefits from integrating the Bio-Mat into their lives.